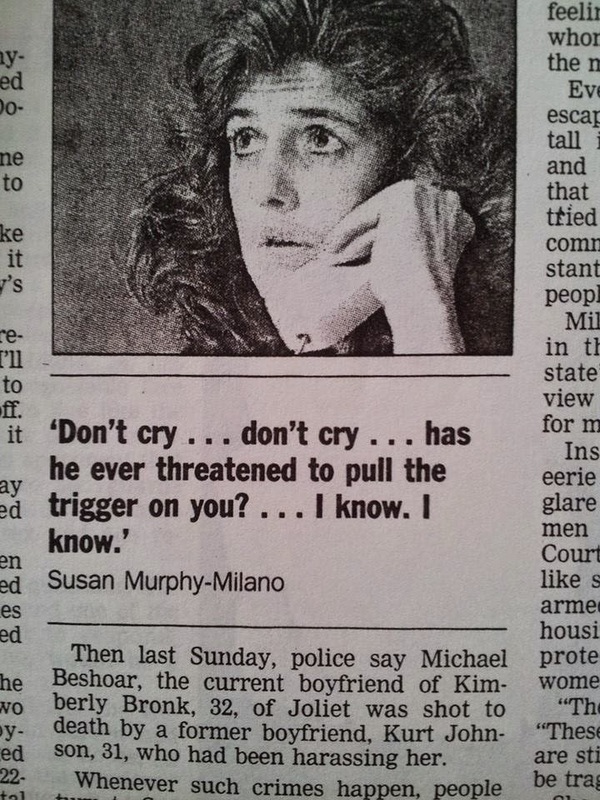 It was August 1993, Susan Murphy–Milano had already lived at least five of her seeming nine lives by that time. She had experienced a childhood like no one should ever have to bear, serving as the “in resident protective services” for her beloved mother who had experienced years of abuse and violence from her detective husband. “Sometimes Roberta called the police, but she usually didn't even get to see the responding officers. Phil Murphy would flash his badge, joke with the guys, close the door, and return to battering the object of his disaffection…. "He called her sometimes 20 times a day at the office where she worked," notes Milano. "He constantly accused her of infidelities. He claimed she was a lesbian; he claimed she was having affairs with other officers….He always told her, "If you leave, I'll find you; if I find you, I'll kill you." Susan was reeling from a personal relationship that caused more pain and heartache. She was doing her best to raise a preschooler with the help of a dedicated babysitter. 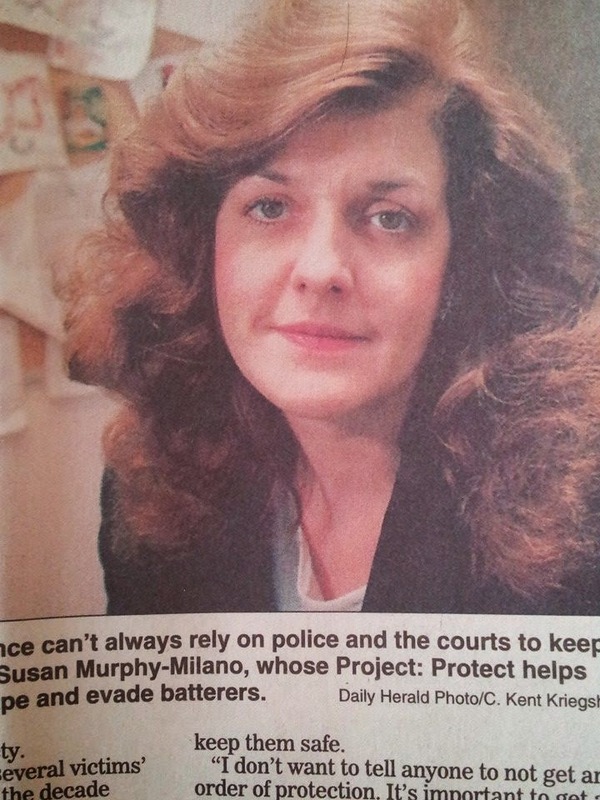 In 1993, she had been taking on the role of Advocate in Chicago’s Domestic Violence Court without question for three years. Even if she was denied, she had the Domestic Violence Act on her side: (Enacted in New Jersey first in 1991). Back in the day, Susan’s initial most celebrated case played out in the hallowed halls located at 1340 South Michigan was that of Dawn Wilson whose ex-husband, Christopher stalked and beat her and was played out on national TV, newspapers and magazines. “Even before their marriage, he'd push her around. “After we got married, the real violence started," Dawn says. Violence that started right after the wedding and never really let up. Christopher was arrested nine times following the divorce, to no apparent effect. " He asked me once, `Why do you waste your time taking me to court?' He knew he would get away with it." 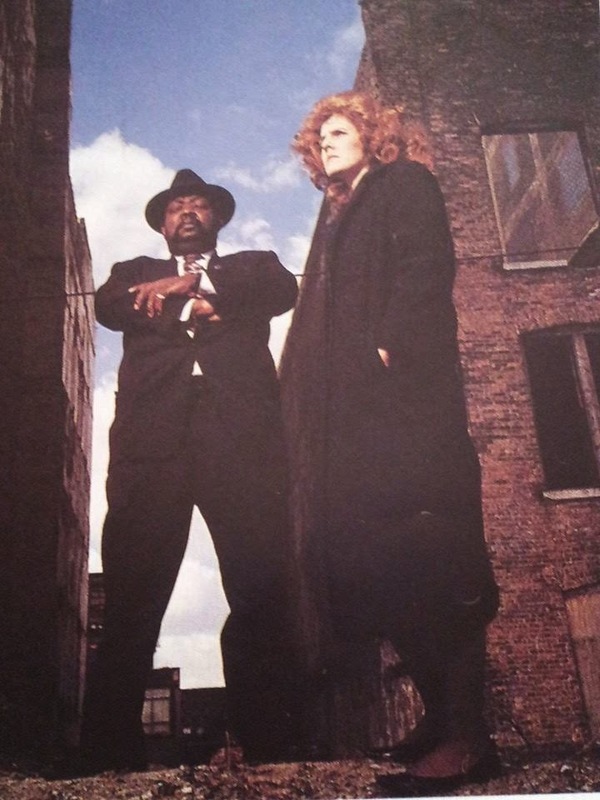 During the classic feature article, “Life Saver” for the Chicago Reader in which Susan was the topic, a typical offender, “Gilchrist” was described as such, “He is not so much physically abusive as verbally abusive and prone to "detaining" her--deciding that he doesn't want her to go to work and taking her keys, or removing the battery from her car, or changing the locks on the garage. But this has escalated to death threats against her and her coworkers; he's even put a knife to her throat. "Each little bout is a little bit worse." said Susan. Intimate Partner Violence had become a way of life in all sectors of society, much to the chagrin of Susan. Although she helped one person at a time, she was “the lone ranger” for so many years, as she skillfully navigated the system in her unique manner. Although her accomplishments were many, it was not until the inception of the Evidentiary Abuse Affidavit that a prevention tool was able to cut across boundaries and have equal access to anyone affected by IPV. But, as I thought of creating this piece, I wondered, what was her “stage” like then as opposed to today? What was the history of the building at 1340 South Michigan, Domestic Violence Court? It was previously known as the “Interior Furniture Company” built in 1922 in Classical Revival style. The area of Michigan Avenue south of Roosevelt Road was originally residential and then gradually became a mercantile area, used by furniture companies, wholesale clothing companies, horse carriage companies, and later automobile companies. The mercantile history of the area, with loft structures that doubled as showrooms, created a high quality design of building facades that tell a story Chicago business and architecture meeting to create a unique building type. In later years, the building served as the site of the Domestic Violence Courthouse. In 2005, there was a lot of controversy about whether this building, among others in a “not so nice area of town” was worth saving. Well, what a difference a couple of years and history makes…. For now we have – “Aviation Lofts” Luxury Living! See video too! How nice it would have been to “shelter victims of intimate partner violence” here! There was a similar problem at 28 N. Clark St., where victims and offenders share a single waiting room. The new building streamlines services for the victims, but it may also improve things for practitioners and the judiciary. Prior to the opening of the new “state of the art” building in 2005, …Only one judge heard civil orders of protection, When the new court opens, there will be two judges hearing those cases. There were more than 5,300 so-called ''independent'' civil orders of protection filed in 2004. Civil orders of protection were being heard at 28 N. Clark St. Criminal orders of protection are heard at 1340 S. Michigan Ave, said Laura Bertucci, supervisor of the Domestic Violence Division for the Cook County State's Attorney's office . As is done at Central Bond Court at the Criminal Courts building, the felony preliminaries are held via closed-circuit television. Among its many advantages, the new Domestic Violence court ''is going to be completely victim-friendly'' was the rave! The new building features separate entrances for alleged victims and alleged offenders, Bertucci said. There are also separate elevators and waiting rooms. Additionally, there are spaces for an array of victims' advocates on the new court's first floor, Bertucci said. The scattered branches put a heavy burden on the victims. ''People who went to 13th and Michigan prior to the new building, , if there wasn’t enough evidence to sustain a criminal charge, then advocates told them to go to 28 N. Clark for a civil order. That made for a very long day for people who've very recently been victims of violence''. The Maze of it all. Without GPS- “Organizational Structure” (See Map) And I’ll bet Susan knew it like the back of her hand! I’m thinking of a little girl from Chicago who wrote a poem expressing the violence that was happening in her home as a means of reaching out. The teacher and the principal did not believe her…and she was punished! That little girl, and author of “Holding My Hand Through Hell” was Susan Murphy Milano!